US inflation expectations: "well anchored"? Or turd polishing in action? I use the term "anchored" to mean relatively insensitive to incoming data. So, for example, if the public experiences a spell of inflation higher than their long-run expectation, but their long-run expectation of inflation changes little as a result, then inflation expectations are well anchored. If, on the other hand, the public reacts to a short period of higher-than-expected inflation by marking up their long-run expectation considerably, then expectations are poorly anchored. On the face of it, there is something smelly about US inflation expectations. As measured by the difference between indexed linked and conventional styled bonds the unadjusted data are laughing at the notion of rising, corrosive prices (Exhibit 1). Fortunately, since it ought to square with observed happenings, this data set can be adjusted (via an artful process performed by the Cleveland Fed). The main (but not only) variable to compensate for is the difference in relative market sizes of conventional bonds (large) and indexed linked bonds (much smaller). This disparity makes the underlying securities behave differently when, like now, an environment of financial stress prevails. At such times the premium investors demand for holding the less liquid indexed-linked bonds rises. Implied inflation expectations tend as a result to be understated. Adjusted (Exhibit 2), the data appear to now show that the belief inflation is contained - or "well anchored" as defined above by Mr Bernanke - is being severely tested. But there is still no obvious sign in the measure that either labour or capital have joined the sect of runaway prices in great numbers - after all everything went to plan over the period 2000-2006 (Exhibit 3). That said, at 3.3% the adjusted measure is now at its highest since 1997 and on a par with the consistently over pessimistic Michigan Survey. The religion of well-anchored expectations, also known as Fed credibility, believes in the central bank's capacity to cap long term inflation. This stops producers trying to pass along short term price increases; and labour from turning out in Main Street for higher wages (except where GM lives). Virtuous circle rather than wage-price spiral. If that faith swoons, as it risks doing, the high priests at the Fed will have serious proselytizing to do. Can TIPS help identify long term inflation expectations? Very grateful if those sites with links in to us would update accordingly - this helps no end with Google, Technorati and Alexa searches and rankings. Feed and email subscribers are not (supposedly) affected. Soros says oil price is only a bubble! 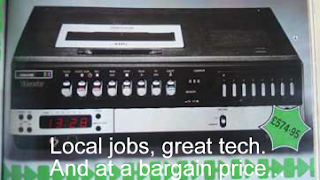 Consumer electronics inflation tame – still time to load up on a HD flat screen TV! What's so great about cheap imported electronic goods anyway? 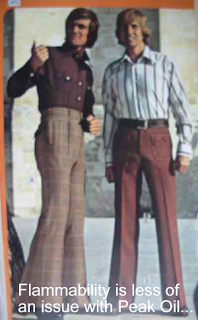 Many thanks to Littlewoods' 1970s catalogues for the fabulous casual men's fashion and Ferguson VHS ads. Baltic Dry Index: "global resilience" say Marketwatch. 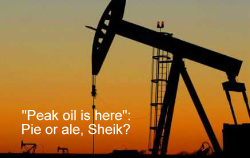 OPEC agree. Marketwatch have an interesting piece on the Baltic Dry Index (BDI) hitting new highs under the headline “Shipping Index underlines global resilience”. Unfortunately, the headline writer does not appear to have read the balanced submission of the journo. One observer cited in the Marketwatch article notes the demand driving the BDI comes from “the Far East”. Well, ignore its steel, cement and coal dealings and 12% to 15% of the BDI is just China and its iron ore imports. By itself. Alone. And the hot news on this front is that, for yet another year, the iron ore producers have once again spit roasted the steel mills into accepting a huge price rise on the 2008 contracts. Why is this relevant? These new prices - a 71% hike year over year - came into force in April. China’s steel producers therefore stuffed all they could get onto available ships at pre-April prices (and before Olympic preparations taper away). And competition for the ore was in fact so heavy that spot rates in April were over 270% greater than contract. This is the “demand” spike, such as it is. It is not “global” – “prepaid and local” might be more apt - and, in the presence of record port stocks of iron ore in China and the imminent falling away of Olympics-related demand, does not appear particularly sustainable or "resilient". But it does have a disproportionate short-term impact on freight rates because of two critical supply-side factors. As mentioned in the prior BDI post ship bunkering costs continue to march upwards with crude. Unfortunately, the Marketwatch piece neglects mention of this factor which is directly reducing ship supply (by forcing vessels to steam more slowly in an effort to cut operating costs). Moreover, port infrastructure has been shown inadequate once these ships arrive: loading and unloading delays are running into several weeks far and wide. This also effectively reduces ship supply as the boats stand idle waiting for cargo. These are the two persistent, almost semi-structural, drivers behind the BDI’s rise. The index is riding supply constraints – not demand “resilience”. A question regularly received from non-France domiciled friends and to which half the response is "this nation's ability to produce a strop by reflex is a great - but misunderstood - quality which other cultures could learn from." The other half of the answer is for another time. This ought to be put in a broader context before any ritual anti-French messages (shame on you) worm their way back down this ethernet connection. Over the last 40 years there has been a reversal in the relative growth rates of income and GDP in France: the average rate of increase in disposable income has more than halved since 1970 whilst that of GDP has doubled. So context does (perhaps) explain some of the strop. And it may even help explain the evolution of the French automobile from fun-machine to dull, bland but worthy . 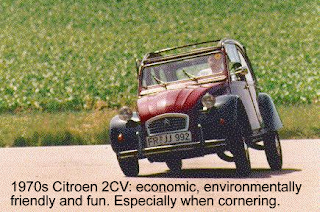 UPDATE: The spoof 2CV ad based on the original C4 Transformer. And the campaign pitchman for the C5. 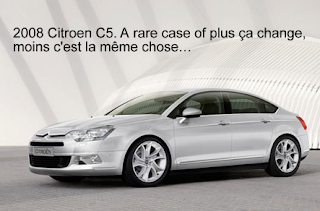 Citroen sadly desperate to ride Teutonic coattails. Given the international interest, some further detail on the free subscription offers. The system works by geographic location. Some publishers will not make offers outside their target areas. The Deal and The Economist (trial) for example, will not send free subscriptions outside the USA. But several others have international offerings including (but not limited to): World Oil, Risk & Insurance, Global Finance and Fierce Finance for example. And should there be an overlap with your financial market interests both Feed Management (see pin-up above) and Poultry International can be had outside the USA. The full catalogue has an international eligible section detailing all such offers. Generally subscribers to these offers must be professionals of the industry served by the magazine in question. Finally, the entire gamut of offers by industry can also be viewed via the widget below. Yesterday the Baltic Dry Index hit 11,067 defying, it seems, the relationship it has long had with 10 year Treasurys. In part this may be due to bond yields being extra low for fear of the credit crisis. 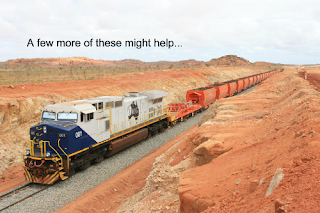 There are also the infrastructure bottlenecks at ports to factor in – ships are waiting weeks to load. Or it may indicate, as such divergences have in the past, that the global economy laughs in the face of leveraged debt irresponsibility, has Range Rovered at pace over the speed bumps, and is now set to resume growth. If it ever slowed down. As posted here in December ships still fetch handsome prices with spot freight rates and future assumptions of such rates continuing to underpin the market. But bunker (fuel) costs, also touched on in that article, are now so high that it is notable, in spite of stunning freight rates levels, that some shippers have actually begun to record losses, or losses on some routes. Eitzen Chemical, for example, this week recorded a net Q1 loss due (in part) to sharply increased bunker costs. Bunker costs have moved from being a typical 15% of freight costs to, on some routes, 50%. One consequence is that shippers may begin en masse to operate at lower speeds to save fuel, which in turn effectively reduces ship supply and (probably) supports the prevailing high rates. Indeed, this appears to already be happening. Last October bunker rates were about US$400 a tonne. They have increased US$100 since and even the least impacted trade routes have generally seen profitability hit by 15% to 20% if not the aforementioned half. Moreover, bunker prices are nearly perfectly correlated to crude prices; and were crude to rise to US$150 per barrel then bunker would sit at US$650 a tonne. This math is deeply unattractive for shippers. Ship owners can try to pass these costs on. But judging from the Forward Freight Agreement market where nearly all route prices are in backwardation – a marked change from the early April data – even they seem to expect the good times to roll up against some sort of inflationary limit. Data sources: Clarksons; and McQuilling. The day in the United States a white Southern senator endorses a black Northern (of sorts) peer as the Democratic nominee for President is an auspicious one. But in itself it probably does little to affect the Electoral College (EC) arithmetic facing Mr Obama. There are decent odds Mr Edward’s will be Mr Obama’s vice presidential candidate. This would be more than a quid pro quo: it is acknowledgement of the importance to the Democrats of winning their two traditionally core regions. The first of these is the south - especially the key state of Texas. Unfortunately, the reality is that democratic deputies have not brought home the geographic bacon in recent times: Mr Edwards, for example, failed in 2004 as the VP candidate to influence the result in even his own state of North Carolina. Mr Obama might usefully consider a candidate who offers other strengths*. The other traditionally democratic geography is the urban northeast. With his senatorial seat in Illinois Mr Obama is at least operating from a key base in EC terms: New York, Pennsylvania, Ohio, Illinois and Michigan represent over 25% of the 537 EC votes. But Mr Obama won only the primary in his home state against Mrs Clinton. The reasons are not difficult to identify. 40% of US electorate are white males. Many within that are blue collar voters earning under $60k annually. They have little to identify with in Mr Obama and are perceived as hard for him to win over. Whilst overwhelmingly Democrat they are vulnerable to Republican appeals, noble or otherwise. Many may turn out for him anyway come the general election but they are very clearly the swing factor if the contest is close. And will it be? A year ago with Iraq as the number one issue it was, on my model, a narrow but definite Republican victory. But recent polls show domestic issues, and the weakening economy in particular, as the dominant themes (despite losing some ground to Iraq since the autumn). Should that remain the case the election will be fought on classic Democratic ground; and a white male candidate plus a poorly US economy would comfortably win them the White House in November. A black male candidate, plus the aforementioned swing constituents, and the result falls within the margin of error. Mr Obama needs a recession with some bite to hedge against prejudice in sections of the electorate. If history shows anything it is that money trumps bias. *Several websites suggest one potentially superior running mate able to counter many of Mr McCain’s attractions: fellow Vietnam veteran Jim Webb of Virginia. This excellent New York Times article gives some insight as to why. Since February there has been a crescendo of voices arguing that the worst of the credit crisis has past (see Exhibit 1 at the foot of this post). A few isolated souls were even claiming as much back in September. The list of optimists is long and includes John Thain, Warren Buffet, Henry Paulson, Bill Miller, Sir Win Bischoff, Alan Greenspan and the Bank of England. But their argument generally separates the banking book loss element of the credit crisis from its slow seepage into the real economy. In this the optimists’ views are disappointingly disingenuous. And yet even the heart of their assertion is questionable given the ambiguity of recent bank results. On Monday HSBC presented well-received numbers (albeit data that possibly said more about the righting of poor company policy than the environment they operate in); but today saw Bradford & Bingley plc launch a major cash call a scant month after denying the need for such a requirement. French banks present similar interpretative difficulties: Société Générale sparked some relief that there were no surprises in its report; and BNP Paribas continues to bask in its reputation as the nations largest and most prudent house having lost a mere €900m to the credit crunch. 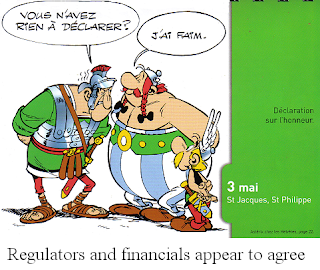 But what to make of Crédit Agricole? It reported broadly in line yesterday but followed up an April-announced capital raising of €3.9bn via the issue of preferred shares with plans for what appears to be an additional €5.9bn. Speculation in the French press of even larger than disclosed investment bank trading losses at their Calyon filial look plausible - a notable deterioration over only a month. Perhaps it is all a nadir for banks as far as balance sheet damage goes. But look no further in today’s headlines than Spain for clues that the real economy has yet to trough. 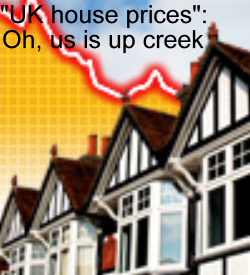 La Tribune are reporting this lunchtime that property transactions are off 60% in Q1; house price declines of 20% are being seen; and the boom in both government budget surpluses and employment nurtured by a decade of property/construction expansion are being sharply reversed. A capacity crowd watched with me in the new Stade de Alpes (budgeted €30m, cost €73m) in Grenoble as the home team earned promotion to the French first division with a draw against Châteauroux. Funny thing incentive. Grenoble required a point – that is, a draw – to earn the right to play next season with the likes of giants Lyon, Bourdeaux, Nancy and Marseilles. The opposition Châteauroux squad also needed a point– only in their case it was to stave off relegation to Ligue 3. Unsurprisingly, what was served up was dire. Most of the action came very late when Châteauroux defended heavily and Grenoble as a result felt safe enough to launch several forays forward. But in the entire game there were two genuine saves and one pressured goalie clearance. But that was not the point. The bigger picture was the party for the historical advance to the big time; and for that the boisterous crowd led by the Grenoble’s flare-wielding “Red Kaos 94” nutter-fans (friendly chant for every opposing goal kick “ooooooohhhFILSD’ENCULE!!! !”) led the way. Parallels to the world of finance are tempting. The leveraged debt financing of the stadium was justified by the promise of promotion, an ethereal piece of reasoning if ever there was one (c/f subprime is not a poor credit risk in this economy). The team owners – Japan’s Index Corporation – got exclusive use of the stadium via other people’s money without having to pay a cent themselves. And when construction costs more than doubled the public was again and again tapped for the difference. Punters and players rejoice. But with Ligue 1 status earned it is going, sort of, to plan. The fact that Lyon sent a second eleven here for a cup-tie during the winter and won 4 nil has not been taken as a portent of the forces lying in wait. And with the taxpayer keeping goal (here too) why should it? The persistent use of bastardised versions of Keynes’ “prettiest girl” metaphor to promote speculative trading is matched, perhaps, only by the cult of momentumism in stock markets themselves (if the google result of “Keynes prettiest girl” is reliable evidence). Yet Keynes was not – far from it - recommending a method with the analogy: he was making analysis. The full chapter can be found here; abounds with often-quoted JM Keynes specials but, crucially, sets them all in context; and ought to be required reading for anyone active in markets. If only as a hat tip to truth in advertising standards. Unfortunately, judging by some recent offline correspondence, the link between the promotion of momentum methods and Keynes’ quote is strong. Yet the man himself, after a decade of large ups and large downs with his own prettiest girl methods (based on short term forecasts in the values, relative to money, of currencies and commodities) was wiped out in 1929. It would be wrong to say he stopped speculating entirely. But the fortune he rebuilt was as a contrarian – notably using negative selling momentum during the severe pessimistic trough of 1932 as a signal to buy and build a concentrated portfolio of companies he judged fundamentally attractive in balance sheet terms. When his will was probated in 1946 over 90% of it was in equity form, shares he had held over the long term (compared to in-and-out momentum devotees). Much of this is visible in his record as bursar of King’s College, Cambridge. A volatile performance (thanks to the concentrated holdings) but over its existence a great one. And not one that was the result of momentum trading. NB: Much of the info herein from Robert Skidelsky's fantastic 3 volume biography of John Maynard Keynes. "A bank would have to increase its capital against $100 million of bonds to $16 million from $1.6 million if a bond was downgraded to below investment grade from AAA, under global accounting rules"
There is some self-interest at play: banks are clients. And there is the pressure of politics too - regulators agree with banks (but probably not for all the same reasons) that market mechanisms have "overshot" (see the Bank of England's Financial Stability Report for example) and needlessly threaten the financial system. Co-ordinated truce or otherwise it signals the banks to bail hard before the raters are forced to act/let off the leash (which seems to be happening in dribs and drabs). Two contrasting articles from the FT and the Independent. The latter (not mortgage backed securities debt) obliquely touches a point previously raised in this space - that banks would end up ceding function to parallel lenders. But that's an aside. The main question these deals raise is what is the benefit to the likes of Blackstone and assorted private equity of a stay from the ratings agencies? There isn't an obvious one. Simple economics says creating a false market (by not downgrading) merely defers discretionary buying activity. 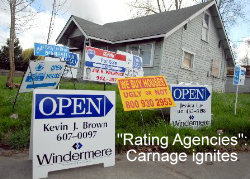 Blackstone pays attention to what ABX indexes read; they know rating agencies are looking to begin downgrades imminently; and yet they have settled on a 75 cents on the dollar deal. 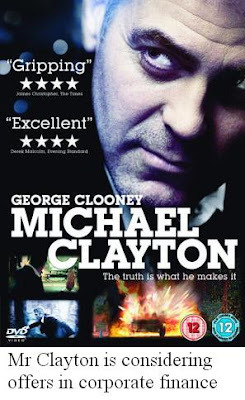 Curious and perhaps the deal-by-deal detail provides the answers. But the temptation to open the floor to speculative inferences is great. Last Friday some Swedish friends and I hiked a 1000m ascent from which I have been recovering since. During the pain talk turned to the Finns – major rivals to Swedes when it comes to ice hockey. Give them their due, said my friends, they are fearless - especially in youth. Which is why (went on the Swedes) Finnish teenagers, too young to worry, dominate the mad sport of ski jumping. As I re-read the ABN Amro/London Business School study released last February on (in part) momentum I wondered if this madder than the rest 17 year old Finnish momentum man profile is one whose time has come. The thought of that momentum work came up because of both the Finnish chatter and Bill Miller’s last quarterly letter cited in the previous post. Mr Miller made several thoughtful comments on value versus momentum. And overall there is in his commentary a slight, perhaps inadvertently left, impression that some kind of ‘fashion’ for momentum has damaged his Value Trust's performance over the last 2 year almost as much as the credit crisis. But the ABN Amro/LBS study, long term as it is, seems to belie that conclusion. Perhaps the Legg Mason Value Trust just has had less overlap than usual with what momentum groupies - not so much a fashion group than a permanent market commando force - lately have favoured buying? The seductiveness of momentum is its ability to capture whatever the perceived successful investment style of the moment is (including 'value') and transform it into an instant positive price trend. Is this somehow a marketing triumph promoting casino skill at the expense of business analysis? Beyond a certain valuation point it must be; and from then on momentum following becomes akin to a religious act. Certainly it becomes self-fulfilling and prone to fantastic reversals (c/f "he lived to jump again but never with the dare he had before"). Yet momentum is obviously an important factor to consider for investors and speculators (based on a reasonable reading of the ABN Amro/LBS study). But how it might be reconciled – and whether such an outcome is even desirable - with the habits of devotees to the scrutiny of underlying businesses is tricky. Ultimately a flourishing business correlates completely with the price of the company's equity. But it can take awhile for the match to appear. Most non-momentum equity investors therefore look for some sort of catalyst for price appreciation. Mine is free operating cash generation: few things - price momentum itself notwithstanding - attract interest like a growing cash pile. Still, in a concession to the hot breath of momentum on portfolios' collective necks, who does not look at relative price strength (for example) to round the analysis off? I do wonder, though, if technical indicators of momentum say more about the popularity of strategy rather than its effectiveness. Or can that differentiation be made only if there is an allowance for time horizon? And even then? There is, I think, some nuance in these questions (compared to the usual technical versus fundamental analysis debates) which even pragmatists may want to mull. Always grateful for views via email or the comments. Exhibit 1: "Déclaration sur l'honneur"
Two weeks ago the Financial News (subscription required) was reporting on the active put market in financials citing Lehman, Morgan Stanley and Wachovia as concerns and/or catalysts for the increasing bets that more falls were due. 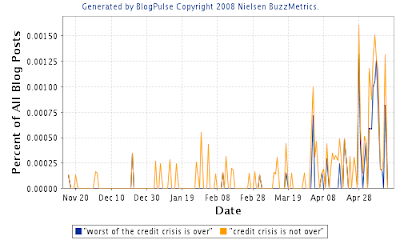 At the time Legg Mason's Bill Miller and Pimco's Mohamed El-Erian were concurrently writing different conclusions as to what stage the credit crisis is at. 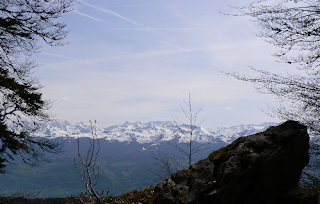 Mr Miller argues the peak is past; Mr El-Erian that, though that may be, the financial system is now in a weakened state and vulnerable to the significant economic downturn in prospect – which would re-ignite the credit fire embers. Then came last Thursday the Bank of England’s (BoE) biannual Financial Stability Report (FSR). Funny thing, bias. Not many would claim the BoE is an institution that calls a spade an effing shovel. In spite of some fabulous graphics, beautiful packaging and a ton of brainwork the report boils down to a self-serving (could be coincidence of course) argument that markets have got it wrong and have overshot badly. There is a risk, say the BoE, of a self-fulfilling destructive tendency. This is an opinion sitting on the impressive assumption that the mortgage-backed securities (MBS) market can recover sufficiently to justify the BoE's opinion that mark-to market is a dangerous, socially anarchistic notion. Ever since credit dysentery took Bear Stearns to Jesus that view has been furiously peddled by regulators and owners of MBS. Capital raising activities - key to restoring balance sheets - have been made sometimes to look like minor hedge actions rather than the primary focus they ought to be. It is, of course, true that if credit spreads narrow (as Mr Miller, a holder of Bear Stearns, JP Morgan and Countrywide, points out) there will be positive surprises in financials. But that does look an act of faith. Lots of intelligence in the BoE. But there is more in the marketplace. Mr Miller and the BoE may interpret ABX index levels and general reaction as panicky exaggerations – and last week markets were clearly giving the benefit of the doubt to their view. 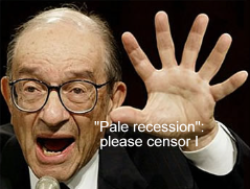 But beside panic many are merely prudent like Mr El-Erian – not a bond guy for nothing. And it is doubtful that camp has been converted to consider this BoE opinion as signal rather than noise.